This is very a much a WW1 related post staring with a very pleasant afternoon spent at the home of Mr. Fox. After a Richard Holmes style lunch (you would have to read his excellent Riding the Retreat to know what I am going about!) 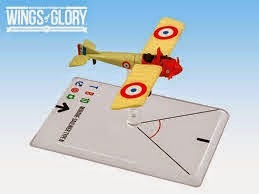 we set to with a game of Wings of Glory - the 1/144th scale WW1 aerial combat game. 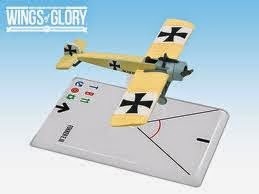 Mr fox has a huge collection of the models for this - including such wonders as Gotha bombers and more fighters than you can shake several sticks at. Many of his models have been custom painted and, like everything he turns his hand to, are absolutely magnificent. The game was played on a couple of Mr Fox's newly acquired scenic mats designed to go with the game - very nice but not cheap. I also took delivery from Mr Fox of a very nice book indeed - the one pictured above in fact - and it is really good. I mean it is REALLY good! 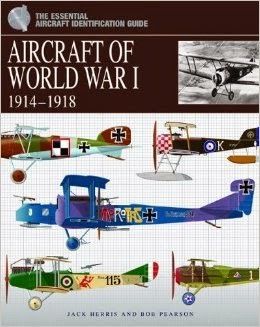 Published by Amber this came from the Works for the princely sum of £4.99 and it covers virtually every aspect of the Great War in the air and with theatre specific coverage - including Turkish Albatross fighters....It is very colourful with lots of technical details and as good a selection of side views as you could wish for. It has got me even more inspired following on from Kaptain Kobold's 1/600th aerial adventures using his home grown Spandau and Lewis rules. All I need is a Tumbling Dice catalogue and a cunning plan or two. Finally, I managed to watch the last of 37 days - the BBC dramatisation leading up the outbreak of WW1. I enjoyed this - if enjoyed was the right word - and it has given me much food for thought about the war in general. Finally (yes I know I have said it already!) I also managed to make a start on the eight dreadnoughts for the High Seas fleet. All in all it has been a pretty good Saturday and I would like to extend my thanks to Mr Fox for a quite superb afternoon - the Green King IPA went down like nectar! I have just returned from a family Easter (and a belated happy Easter to all) in the wilds of Norfolk, deep the heart of the Broads. It was a pleasant way to spend a bank holiday weekend - even the traffic was relatively kind although I still despair at the road manners of many drivers! 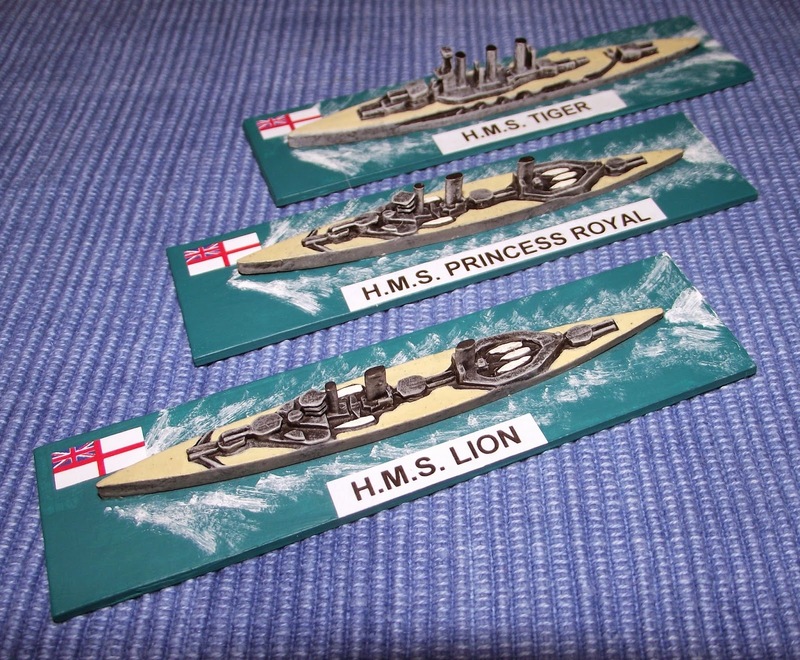 The Royal Navy contingent thus far - H.M.S. Tiger at the top of the picture completing the formation. 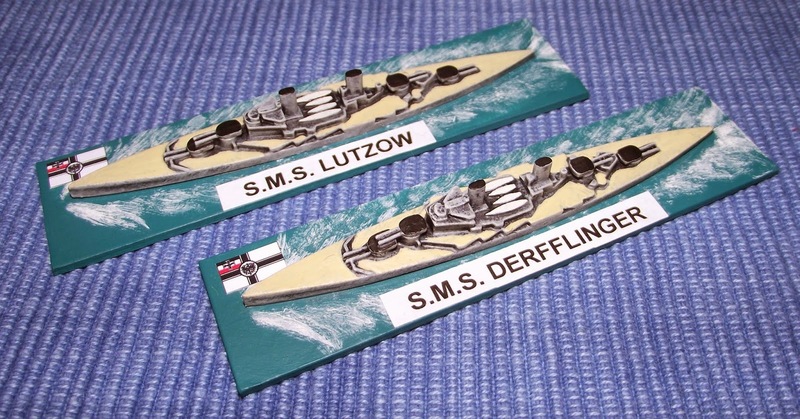 We arrived back early this afternoon and as the rest of the day was free I took the opportunity to finish the two Lion class battle cruisers for my 1/2400th scale WW1 naval collection. Once again the Stonewall castings are fairly basic but they scrub up rather nicely and whilst not in the same league as GHQ and C in C they are perfectly adequate for gaming pieces. The painting technique was my usual black undercoat and dry brush top coats withe main part of the decks picked out Humbrol Mast Oak. Mention of this particular colour has raised a couple of points to consider. Firstly, the old Humbrol Authenticolour range is no longer (as far as I know anyway) and I only have around two thirds of a tin left. I recently had to give the tine a good mix, stir and dilute with thinners which should prolong its life - at least for long enough to complete the remaining models anyway. 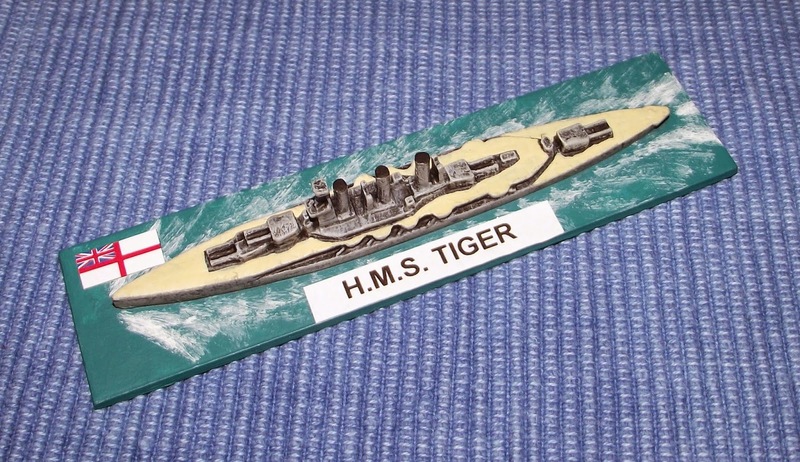 I have a third casting of this particular class and was tempted to paint it up to represent the Queen Mary but for the fact I would need to change two of the funnels for round versions. I have some rough castings that could easily sacrifice the appropriate round funnels if so desired and I may tackle this at some point but it is not essential at present. It has taken me far longer than usual to get these five models completed but now I am back in the 'zone' I can press on with a little more urgency. 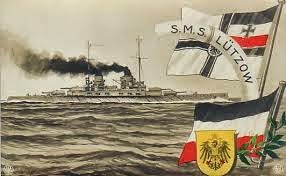 Talking of urgency, I will need to get some earlier battle cruisers for both sides and this will be my priority as soon as the funds are available. In the meantime though, I have some time this weekend to tackle a few items of housekeeping. To begin with, I finally managed to sort out my bases and zip lock plastic bags (cries of what an exciting life you lead!) which is a handy thing to do, albeit a tad uninspiring. Certainly having them all in one place is very handy - especially as I now know where that place is! I also picked up a couple of sets of rules which look like they could be fun. Of Gods and Mortals is a set of mythological rules by Osprey designed around skirmish sized games. Each player fields a force of a God, some Legends and the inevitable Mortals. The number of models needed for a game is quite small so raising forces in, for example, 28mm should not be too onerous. I would have liked to have seen some mores cultures - there is only Greek, Norse, Celtic and Egyptian included in the rules although you can add your own - represented but I am sure this will follow in due course. North Star produce a range of models to go with this and very nice they look as well. It was quite a therapeutic afternoon in many respects and I also uncovered a few other bits and pieces lurking in the depths of the man cave. A couple of these have certainly got me thinking in a number of directions - certainly not in the 'Ooh shiny' way though - but that will be for another day methinks. 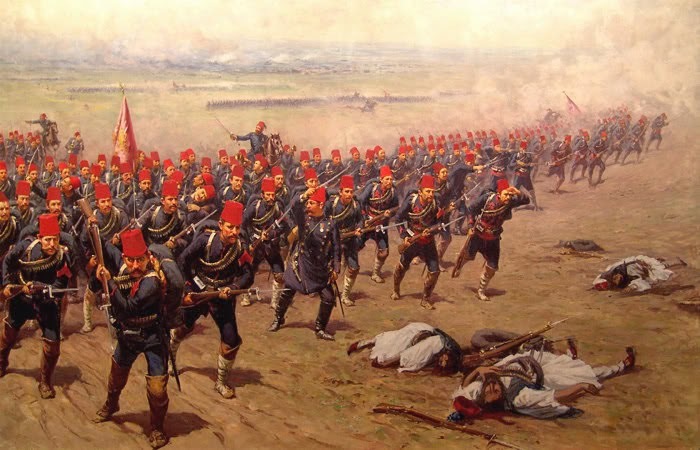 Turks in action against the Greeks. After a couple of weeks of, for me, careful deliberation and experimentation (including painting up some samples) I have finally settled of the scale I intend to use for my armies. In making this decision I have considered a number of factors but it is safe to say that he key one was the relative ease with which the chosen figures can be painted - especially important considering the painting technique I intend employing. I intend using an 'old toy soldier' style of paint job - probably with gloss varnish - which the majority of figures in this scale lend themselves to rather nicely. I have seen some very detailed painted examples of models in this scale but that is not a path I intend to follow - it would defeat the object for me because if I wanted to paint detailed models (actually painting models in detail is more accurate) I would use a larger scale and indeed, I shall do just that for any skirmish type games. I have ideas for a number of projects using this scale but first under consideration will be the Russo Turkish War or Fezia and Rusland by another name. I shall still use other scales for various things - I have in mind some larger scale skirmish games and even some very small models for another idea I am messing around with but the main bulk will be 10mm figures based on 40mm frontages - ideal for using with Hexon tiles.